As long as you’re in the App Store updating to the latest version of Google Maps, you might as well stick around for the new iteration of Chrome for iOS while you’re at it. The search giant’s mobile browser has even more features to recommend it now. While there are some small but significant improvements, in the form of an accessible history (better late than never), better voice search and text-to-speech capabilities, and a fullscreen mode on the iPad, a couple of the enhancements are of particular interest. A new option now lets you choose to have links to specific Google services—currently Google Maps, YouTube, Google+ and Google Drive—open in those apps, if they’re installed, rather than in the browser. You can even choose to enable that support on an app-by-app basis. Google says that options for more apps will be added soon. 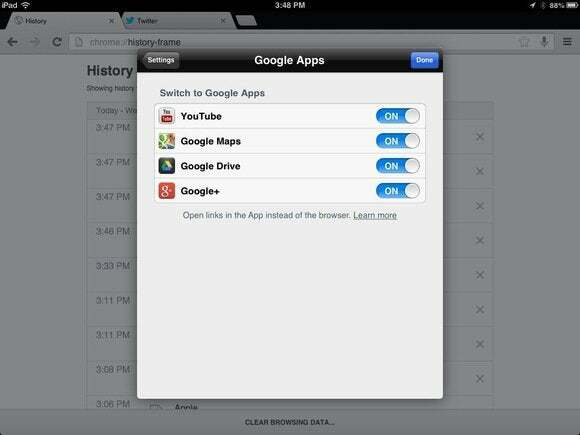 Chrome for iOS now lets you elect to open certain Google services in their native apps, rather than in the browser. That addition only reinforces the Google microecosystem that the company’s built in iOS. While iOS still won’t allow you to set Chrome as your default browser, or Gmail as your default mail app, if you’re the type of person who lives largely in Google’s services, this is pretty much the closest alternative. At a guess, the data compression feature probably works similarly to like-minded features offered by folks like Opera and Amazon, which compress data on their servers before sending it down to you, the client. Of course, that also means that all of your Web data passes through Google’s servers on its way to you.